Lochranza Castle, Arran, Scotland. 10x8 Photograph (25x20cm) Lochranza Castle from Robert Harding . Substantial remains of what is probably a sixteenth century building sited at the extremity of a peninsula jutting out into the loch. The existence of a castle on this site is first recorded at the end of the fourteenth century. 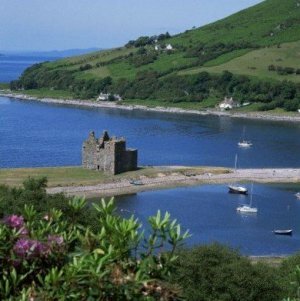 Located, Lochranza, Arran, Scotland.